Last time the Cavaliers played the Hawks, things did not go well. The last two games for the Cavs haven’t gone well, either. Things need to start going well, and soon. As members of the easy Eastern Conference, the door is wide open for the Cavs to do something special if they can get it together. They’ve displayed signs of that, but they’ve also displayed signs of completely falling apart. Coach Mike Brown says he may change the lineup to try to pump new life into the team. That’s probably not a bad idea. It’s not time to panic, but it’s time to win a game, or at the very least, take positive steps. 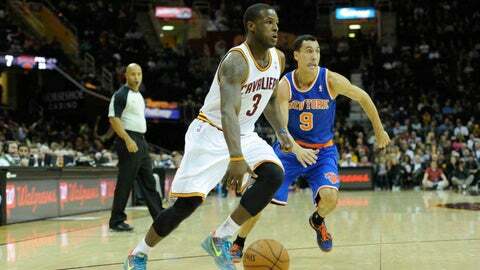 * Cavs G Dion Waiters (wrist tendinitis) is again a game-time decision. Waiters, the team’s second-leading scorer (14.9 ppg), has missed the previous three games. * Hawks F Cartier Martin (ankle) is doubtful. * Irving was 0-of-9 shooting for the lone scoreless game of his career in the team’s first meeting (Dec. 6), a 108-89 Hawks win. But he has scored at least 20 in six of the previous eight overall. * Korver set an NBA record for consecutive games with a made 3-pointer in the first Cavs-Hawks game. That streak is still alive and is now at 97. * Second-year Hawks F Mike Scott is averaging 10.8 points and shooting 68 percent over the past four games. Hawks GM Danny Ferry stole Scott in the second round of the 2012 NBA Draft. * The Hawks are first in the league in assists at 25.7 per game. They have recorded assists on 66.4 percent of their baskets, also first in the league.